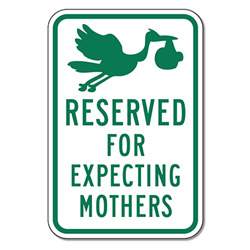 Expectant mothers will appreciate our "Expecting Mothers" signs that reserves parking spaces. Mothers will remember the convenience of your parking lot and are more likely to return, even after their baby has arrived. This good gesture and additional convenience that you provided will make everyone appreciate your business and continue to shop with you because of your sentiments. DOUBLE the working life of your Reserved for Expecting Mothers Signs by adding 3M Protective Overlay Film (POF)! 3M’s high-tech POF protects sign faces against fading caused by the sun and harsh weather—and makes graffiti and sticker defacement damage easy to clear away without harsh abrasives.